I found this recipe through Pinterest posted by Once a Month Mom. 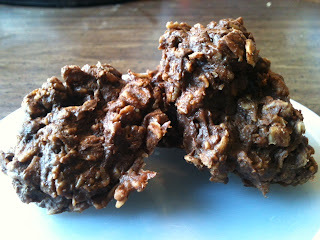 I love her site, her recipes and her ideas and knew when I saw this recipe that I had to try it! Over the past week and a half our household has been working very hard to recover from a vacation filled with less that stellar eating and a bit too much sugar (in the form of sweets and alcohol!) The problem for me was I am a sugar ADDICT! I knew I would never make it through the vacation detox period without serious tricks up my sleeve. One of them I already posted about, Whole Wheat Blueberry Muffins. They were delicious and helped with the sugar cravings, but I needed something more...I needed chocolate! Oh the sweet, delicious, addictive substance of my dreams :) Now I knew that I didn't really need chocolate, I just wanted it, but I also knew that if I didn't find a way to get the chocolate into my diet in a "healthy" way I was going to cave and eat a Snickers bar large cake shake from Portillos (no judging please!!) So I searched my trusty resource, Pinterest, and found these cookies with a simple search for no sugar cookies. After having made these once there are a few changes I would make, nothing major just more fitting to my tastes. I would change the number of bananas to 2 and increase the applesauce and peanut butter to compensate. I found the cookies to be very banana-y and I am not a huge banana person. I would definitely keep the cinnamon, but add a full teaspoon because I love cinnamon. I might also consider using chunky peanut butter for texture, but not sure on that one yet. Finally, make sure you store them in the refrigerator (or freezer) and eat them all within about 5-7 days (longer if frozen), otherwise the banana takes over and you taste nothing else. Overall this is a fantastic recipe and I am so excited that Once a Month Mom posted it and that I found it. If you make these let me know what you think, and if you make other changes, please let me know. I am always looking for new ways to satisfy my sweet tooth...without feeding my guilt monster! Don't these look delicious?? ?